Whether your tastes are social, technical, or competitive, RMR has something for you! 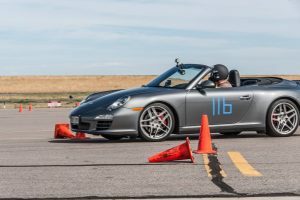 You can have fun in your Porsche by participating in driver education and time trials at area tracks, autocrosses, rallies, tours, tech sessions, car shows and more. A tour is a non-competitive driving event in which participants follow a given route to a destination (which may or may not be known in advance). A tour may vary in length from a day trip to a long weekend with an overnight stay or two. Tours usually follow scenic routes (which are plentiful in Colorado) and/or visit interesting or obscure destinations. Tours are sometimes combined with rallies to add variety and a dose of competition to the event. RMR hosts several tours each year; AMR typically offers several as well. A number of tours are usually offered at Porsche Parade. A rally is a competitive event in which contestants attempt to follow a course specified by a set of instructions. Rallies are typically run on public, paved roads, and speed limits are always observed. The two major types of rallies are the Time-Speed-Distance (TSD) rally and the Gimmick rally. In a TSD rally, participants attempt to follow the instructions precisely, maintaining the correct speed, as points are deducted for arriving at checkpoints (the locations of which are not known in advance) early or late. A Gimmick rally is typically a bit less rigid and usually involves solving puzzles of some type. Between RMR and AMR, a handful of rallies— at least one of each type—are offered. 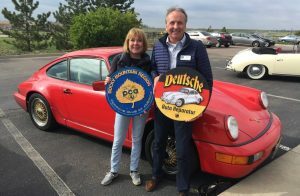 Porsche Parade also hosts a TSD rally, and sometimes a Gimmick rally, each year. An autocross is a competition in which drivers navigate their cars through a course defined by orange cones, usually in a large parking lot. Top speeds are generally moderate, topping out around 40-65 MPH (no higher than second gear for many cars). Competing cars are spaced at long intervals — typically only two or three cars are on the course at the same time. Autocross is a safe way to experience high-performance driving while learning to drive your car at its limit. A driver education event provides a safe, controlled environment for high-performance driving instruction. DE offers drivers of all skill levels the opportunity to hone their driving skills, with the help of an experienced instructor, in a controlled, closed-course environment. In keeping with PCA philosophy, the primary emphasis at all times is on safety. A word of warning, though: the DE experience may be habit-forming! As DE events are not racing, nor preparation for racing, lap times are not recorded. However, some DE events are followed immediately by a time trial event, which gives drivers a chance to quantify their performance. Lap times may then be used to measure personal improvement or for bragging rights amongst your peers, etc. 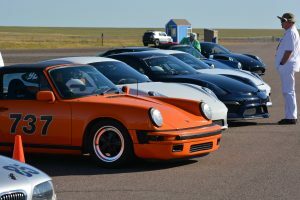 RMR hosts six DE’s each year at High Plains Raceway, with AMR hosting several more at the La Junta, Pueblo and (possibly in the future) Pike’s Peak International Raceway tracks. A club race is a wheel-to-wheel racing event. A race weekend consists of a number of practice sessions and “heats” (race sessions), often involving both “sprint” and “endurance” races. Since a Club Racing license (issued by PCA National) is required for competition, club racers are serious and experienced drivers. The cars they bring with them to the track can be quite impressive! As a point of interest, the PCA Club Racing program was inaugurated with the RMR hosted “First Ever Anywhere” club race at Second Creek in 1992. Because of the logistics involved in an event of this magnitude, a club race requires a legion of volunteers. However, it is also one of most exciting events to participate in, so be sure to sign up! 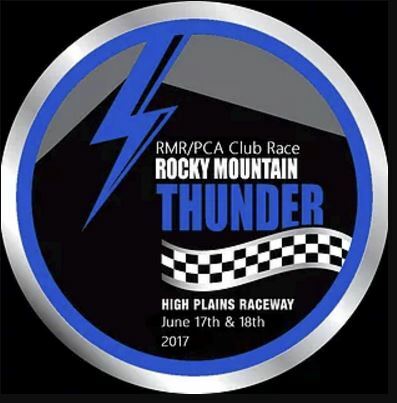 RMR hosts one club race each autumn at High Plains Raceway which, when combined with a Driver Education event, adds up to one thrilling weekend! Membership socials provide an opportunity to reconnect with old friends and meet new members. Historically, a membership meeting begins with a social hour with a cash bar, followed by the evening’s program. The content of the program varies, sometimes featuring a “slide show” from a recent event, or a guest speaker such as accomplished Speed World Challenge racer Randy Pobst. Membership socials, unless otherwise stated, are held the first Thursday of the month. Different venues and topics will keep the meetings fresh and inviting. Watch HighGear and the RMR Web site for details. If you have any ideas for a program, talk to the Committee Chair or a Board member! A concours is essentially a car show, in which contestants endeavor to present their cars in as close to “perfect” condition as possible. A number of judged categories usually exist, typically differentiating between types of cars (e.g. 356, Boxster) and level of preparation (“daily driver” or “full preparation” or somewhere in between). Cars sometimes may be entered as “display only,” for owners who wish to participate but not compete. 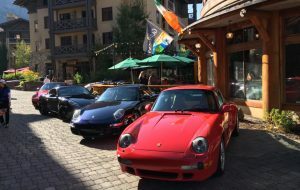 RMR participates in a handful of local concours events each year, including the annual Exotic Sports Car Show and Concours d’Elegance, benefiting United Cerebral Palsy Colorado. The annual Porsche Parade also hosts a major concours each year. A tech session is just what it sounds like–a session in which a technical topic is discussed. Not just for gearheads, a tech session may demonstrate practical, “do-it-yourself” procedures such as brake bleeding. 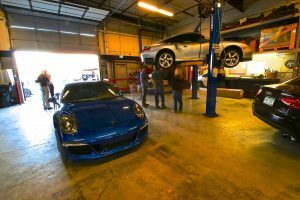 Tech sessions are usually presented by experienced Porsche technicians, many of whom are sponsors of RMR events and High Gear. RMR hosts a few tech sessions each year, typically in the “off months” when few driving events take place. In addition, numerous tech sessions are offered at Porsche Parade.